Electrocompaniet launches new wireless speakers at ISE 2016 | What Hi-Fi? Electrocompaniet, the Norwegian high-end specialist, has launched the first two models in an expansive range of wireless audio and video streamers at ISE 2016. 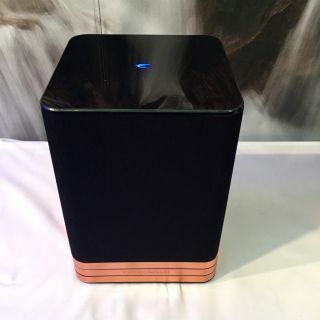 The TANA SL-1 (pictured above) is an all-in-one wireless loudspeaker, amplifier and audio streamer. It use 150 watts of Class A-B amplification, a 24-bit/192kHz DAC and a two-way bass reflex speaker arrangement. There's a tidy control app, and it can stream via Tidal, Spotify Connect and Qobuz as well as internet radio. External connections can be made via its USB, digital optical, digital coaxial or ethernet sockets. The SL-1 can be turned into a stereo proposition with the addition of the TANA L-1 wireless speaker. Its specification is all-but identical to that of the SL-1 but, rather than being able to stream from a variety of sources, it's wirelessly slaved to its SL-1 partner to form a stereo pair. Both speakers will be available in a variety of colours and finishes, and a TANA SL-1/L-1 set-up can be configured as up to a seven-channel home cinema system or as a multi-room system. Provided you have the wherewithal, of course - the SL-1 costs €760 and the L-1 €640. Later in the year they will be joined by the TANA SLT-1 (the SL-1 with the addition of a touch-sensitive control panel), the RENA range (SA-1 video streamer and amplifier; SH-1 video streamer with HDMI; S-1 video streamer; SV-1 4K video streamer) and the SIRA L-1 subwoofer.